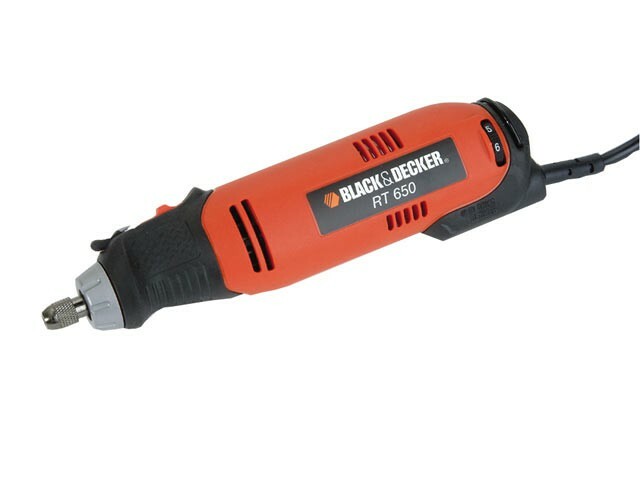 The Black and Decker RT650KA Wizard Multitool cuts, grinds, polishes, cleans and much more. With a powerful high torque motor that completes jobs faster and won't bog down under load. The flip-lock spindle lock provides quick and easy accessory changes, eliminating need to hold down awkward button. It has rubber overmould grips for superior comfort and control and a universal collet system that accepts all standard rotary tool accessories. It offers variable speed for maximum precision in all applications and a separate variable speed dial for set and forget convenience. It is supplied with a kit box to keep all the accessories in one place and an 87 piece starter kit.